Hailey has recently stated to say, "No, Stop it". We usually hear it when Steve is bothering her. I have no idea where she picked that up.... maybe in nursery. She has also gotten to the point where she starts to throw these crazy tantrums and throws whatever is in her grasp. She has been spending time-out in her prison cell crib. She also started to say "ouch" after Steve got home from a Scout Campout with burns on his leg. It's funny to watch her pick up on things. She now says 15 words and we love watching her learn and grow. We just don't like the tantrums and the mood swings. Hailey loves showing off when people are over. She sings. She dances. She twirls and makes herself dizzy. We went to my friend Stacy's wedding. It was the last day the temple was open before cleaning and there were 27 sealings going on. So busy! Stacy had a friend crochet her flowers to mix in with her bouquet. So pretty. Stacy's mom made her wedding dress and it was beautiful. I think I was the only one who got a slice of the top cake, and I had to beg Stacy's aunt for a slice. All three layers were different flavors. I had to promise to eat it before anyone saw me. I am not a cake lover, but this was so very delicious! Hailey was so excited to see the puppies that live next door to us. Look at that crazy bed head morning hair! She is very gentle with animals. Hailey loves to pick tomatoes out of our garden regardless of what color they are. We have made buckets of bruschetta and sun dried tomatoes. Delicious! We went camping last week up at Jackson Lake and it was the first time Hailey has ever been camping. She loved everything about it. She loved exploring and playing in the dirt. We even took some rafts out on the lake. Hailey loves to help and gets upset if Steve and I don't include her in what we are doing. You can see she wanted to help set up the tents. Hailey loves to climb on just about anything. Such a little monkey! My dad's great; he brought and blew up a air mattress for Steve and me while everyone else had to sleep on the hard ground. Update: Hailey just started saying "uh oh." That brings her vocabulary up to 13 words. Hailey has been learning so much. This past month she learned her seventh word, "hi," as you can see here. Since then she started saying all sorts of words. Jeni has been teaching her the parts of the face and she learned to say "nose" and "eye." When counting Hailey says "two." She just started saying "hot" around hot foods and drinks. And as you can see here we've been singing nursery rhymes with Hailey. Here we are singing Ring Around the Rosie, or as Hailey started calling it "Ashes Ashes." That makes 12 words for Hailey. Not a bad vocabulary. It's so exciting to hear her pick up on all these things, especially when it's random like "ashes ashes." It does seem like she's absorbing all this information around her. 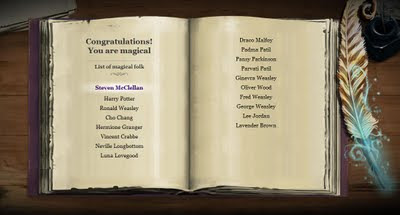 The past 2 days I got up in the morning to discover that the clues on Pottermore were already gone. I had missed out. So today I woke up at 3am to find the clue for day 3 and I found the Magical Quill and my name listed in the book. Now I just need to wait for Pottermore to open. So, in the meantime, good night!